This kit makes it easy to add MSD performance to your new crate engine. Supplied with a steel gear for compatibility with hydraulic roller cams. 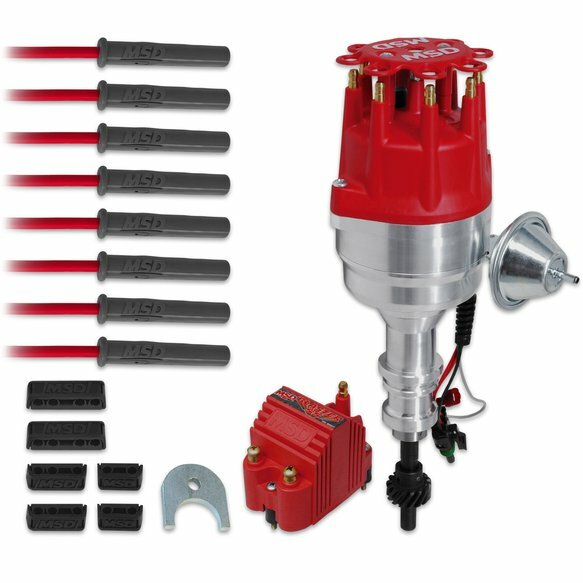 These kits are supplied with everything you need for your ignition including a Ready-to-Run Distributor, Blaster SS Coil, 8.5mm Spark Plug Wires with separators and even a billet hold-down clamp. The Ready-to-Run distributor is a great choice for your engine. They feature a high output module that produces a vigorous jolt across the plug gap and the installation is simple with just three wires to connect! The Blaster SS Coil is a compact and efficient coil that is easy to mount and the system is complemented with MSD's red 8.5mm Super Conductor wires. The wires are supplied as a universal fit, with our straight/multi-angle boots and terminals on the spark plug side and after you route them and cut to length, you simply install the distributor side terminal and boot. Our Pro-Clamp separators keep the wires neat and secure and we even supply a Pro-Billet Hold-Down Clamp for the distributor. For engines with late-model type (HEI “spark plug top”) distributor caps. Multi-angle boots and terminals installed on one end. 90° distributor boots and terminals included.